Johny Lamb aka Thirty Pounds of Bone’s fifth installment of The Ship’s Log is available now. These things seem to be coming in thick and fast. This one’s called, ‘A Man on a Shark’ and it’s another beauty, even if we do say so ourselves. "This is the ship’s log song for Hastings. It documents our unexpected road trip, due to bad weather, through Littlehampton, Eastbourne, Bexhill on Sea and through to Hastings. 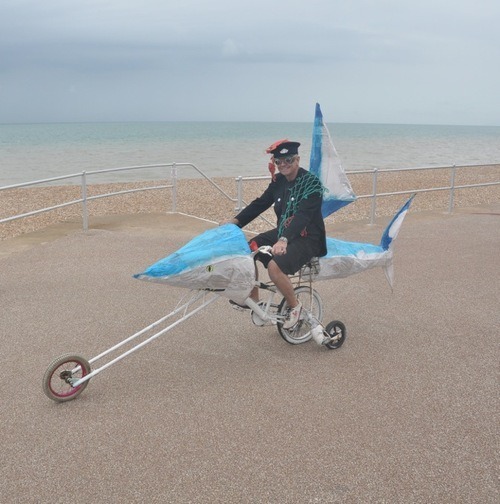 We encountered a great deal of good will from these communities, including the Littlehampton steel band, various shanty choirs, other drum groups and a man on a shark (built from a bicycle, along with other wonderful costumed bikes). This song was written in the back of the FILO pub in Hastings old town, just two hours before it was performed there as part of the ship’s log concert with local musicians Steve, Liam and Richard (a massive thanks to them for being so great)." You can download the song for absolutely free HERE. The Ship’s Log is written and produced by Thirty Pounds of Bone and is part of Lone Twin’s ‘The Boat Project.’ It documents the events and experiences of the boat’s maiden voyage. The Boat Project is part of Artists Taking the Lead, a series of 12 public art commissions across the UK to celebrate the London 2012 Cultural Olympiad. The Boat Project is funded by Arts Council England.